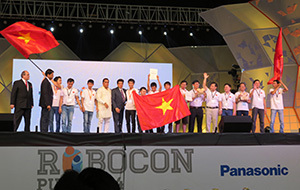 It is an annual handmade robot contest, which started in 2002 for university, college and polytechnic students in the Asia-Pacific region. 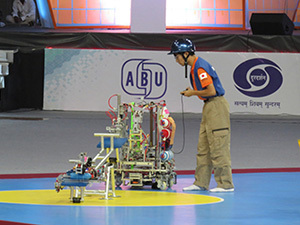 Under a common set of rules, participants compete with their peers from other countries with hand made robots. This contest aims to create friendship among young people with similar interests, as well as help advance engineering and broadcasting technologies in the region. This event will broadcast in your country/region through an ABU member broadcaster. The contest is hosted by an ABU member broadcaster in different country/region every year. Who can participate and what should I do? The contest is targeted for undergraduate students of university/college/polytechnic in the ABU member countries/regions. 1 team represents 1 country/region and your local broadcaster maybe planning a domestic contest. the ABU Robocon bronchure now! Come join this international showdown of ideas in the field of technological creativity! The 14th ABU Robocon will be held in Jogjakarta, Indonesia on August 23, 2015. For more event details, log onto ABU Robocon 2015 official webpage. Host Organizer Televisi Republik Indonesia (TVRI).